Harvest Supper provides a quintessential Oxford-Ole Miss experience – a picturesque evening at Faulkner’s Rowan Oak. Thursday, October 12, 2017 —6:30 p.m.
Sponsorships of $500. and over guaranteed tickets. 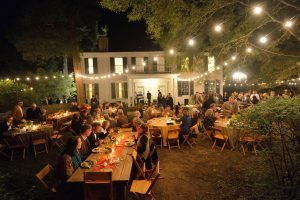 Due to the overwhelming support and generosity of Harvest Supper sponsors, an extremely limited number of tickets were available after Labor Day at $150. each. First notification was given to current sponsors, followed by Museum Members. Upon request, names will be added to the Ticketing Wait List until October 4th. available upon request. Simply call the Museum at 662-915-7073. Parking and inclement weather details TBA. Proceeds benefit the University Museum and Historic Houses. Rebecca and Billy Long Proud Larry, Inc.